I love learning a new method of doing something. 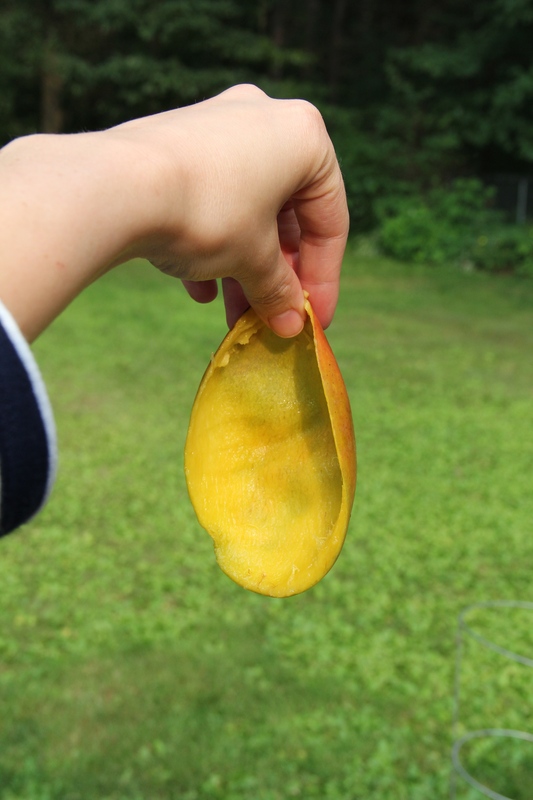 I stumbled upon this way of peeling a mango almost a year ago. (The pictures are actually from July, hence the green grass in the pictures. I have been meaning to do this post since then.) 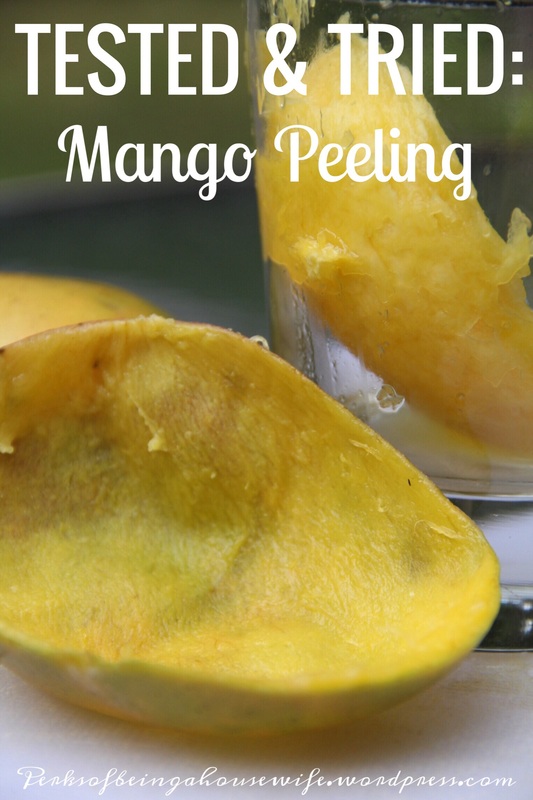 Having learned this, I don’t think I will ever handle peeling a mango the same way ever again! I feel that pictures make for a better teacher than my words trying to explain things. 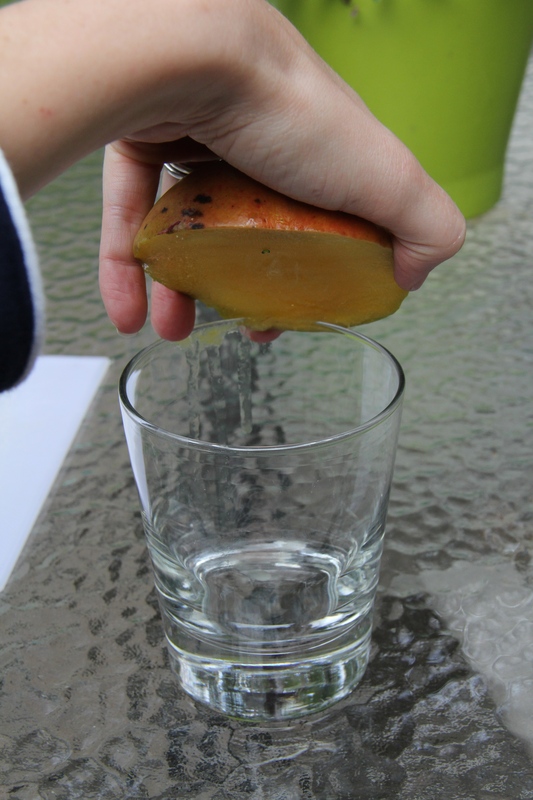 So I hope this helps you see how simple and easy it is to yield nice big chunks of mango without minimal effort. Here goes! 1. Take the mango and find the longest side up and down. Place the bottom side on your cutting board. 2. 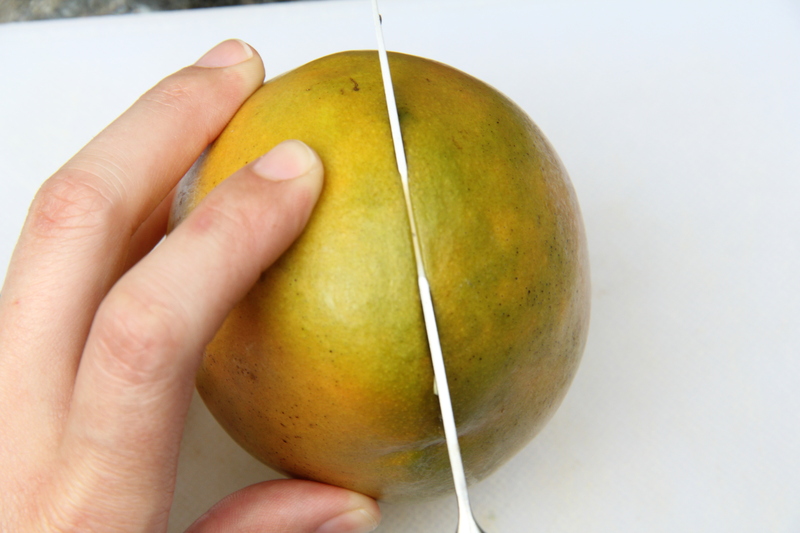 Line up your knife so you will cut through the widest part of the mango. Find the pit which will be in the center of the mango and running the long way of your mango. 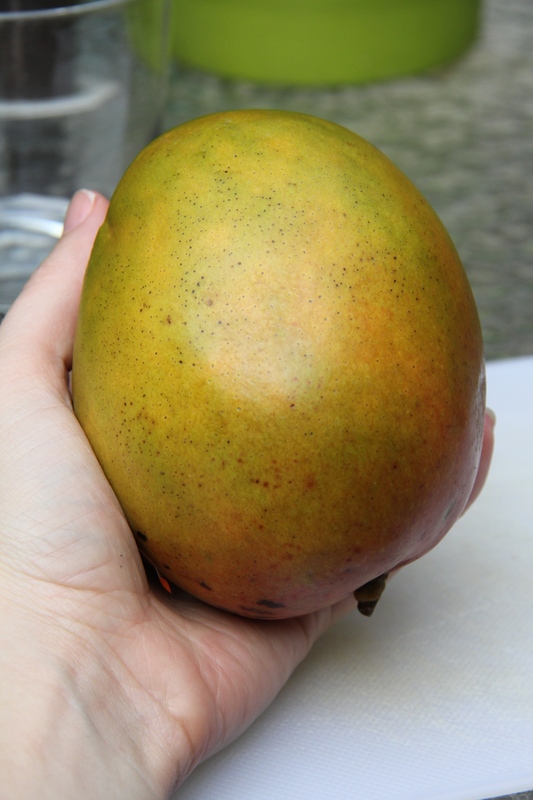 Go on the side of it trying to get as close to the pit as possible so you can harvest the most mango flesh. You will feel it if you hit it. 3. Here’s how my cut turned out. I have one nice big hunk of whole mango on the right. The remaining mango is on the left. Repeat on the other side of the pit so you have two nice halves of mango. 4. 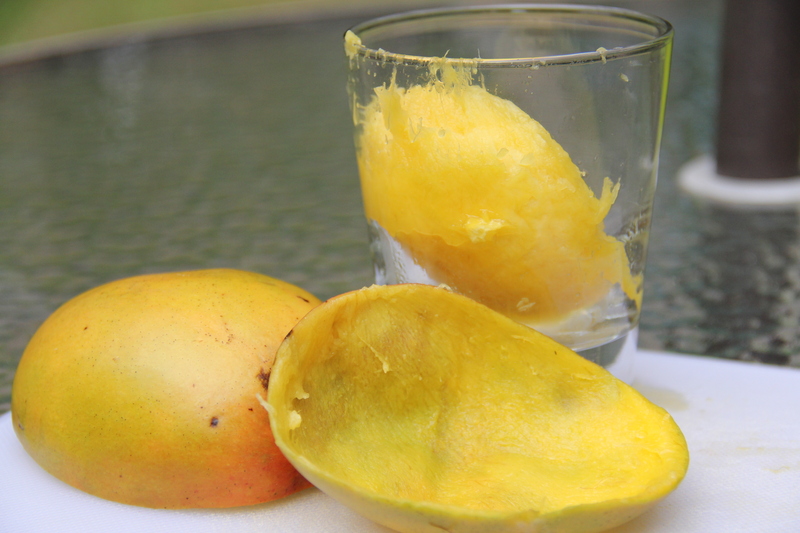 Take a sturdy glass and place the mango half in the palm of your hand. 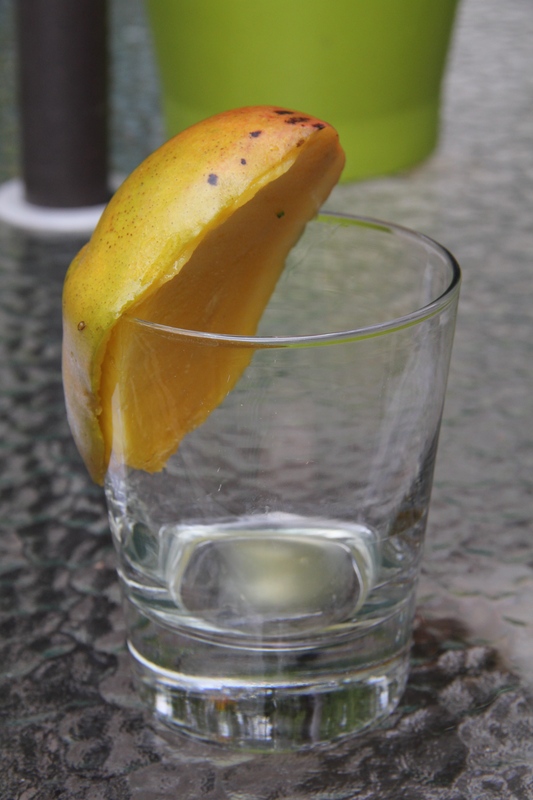 Start putting pressure on the one end of the mango (peeling side up) onto the glass where the flesh meets the peeling. 5. 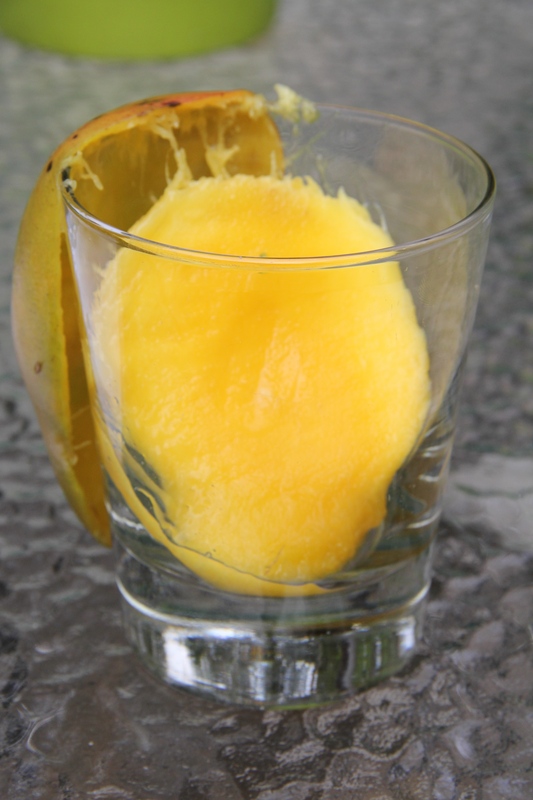 Still with pressure, slide the mango down on the glass so the flesh and juice collects in the glass and the peeling remains on the outside. Run it until your mango is completely peeled. 6.Cool huh?! 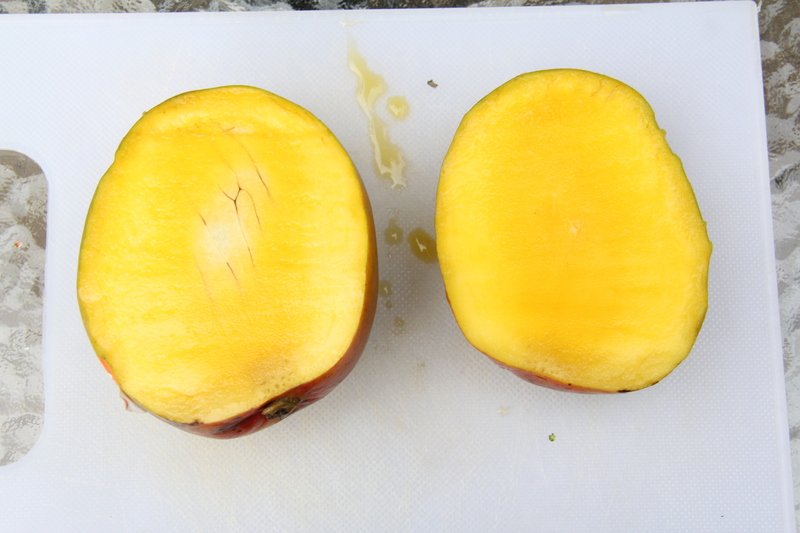 Depending on the type of mango and the ripeness it may be a little stringy since it’s not a clean cut with a knife. So simple though and your juice is all ready to drink right from your glass! Repeat with the other half of your mango. I love that it really does yield the most fruit and all in one clean swoop. So how’s that for a new trick in the old kitchen? It’s getting to be summer and I don’t know about you, but any time I see mango in an ingredient list I automatically gravitate towards it. I will be using this method a lot in the days to come. Here’s to warmer days ahead and yummy fresh fruit too!